I recently came across a small packet of postcards that Paul sent me back in 1983. They were of the fictional variety: we wrote made up notes from made up people and sent them to each other. I'll be including them periodically on my art blog in the coming months. 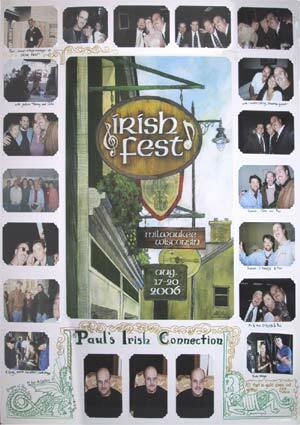 The first one was posted today....."
Paul was in the audience for Tannahill Weaver's 1994 performance at Milwaukee's Irish Fest. In this film clip excerpted from the DVD, look for him clapping at minute markers 1:14, 4:44 and 7:59. 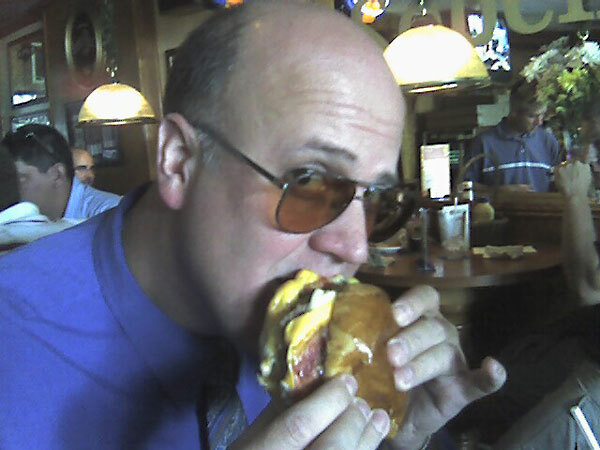 Here is a picture given to me by Marc Belanger of Paul eating his favorite lunch meal – the infamous “double bacon burger from Sobelman’s”. 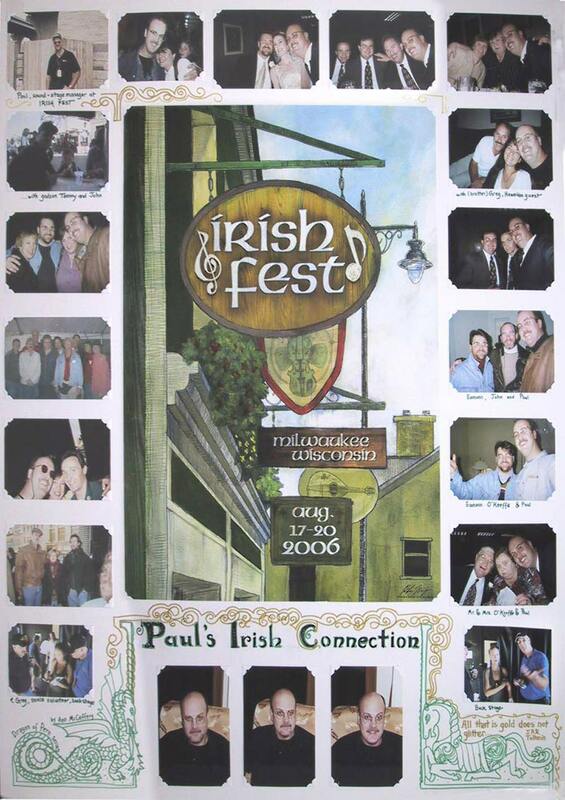 "A group of MU lunch-goers that ate with Paul received permission to put a plaque up in this tavern in honor of Paul. 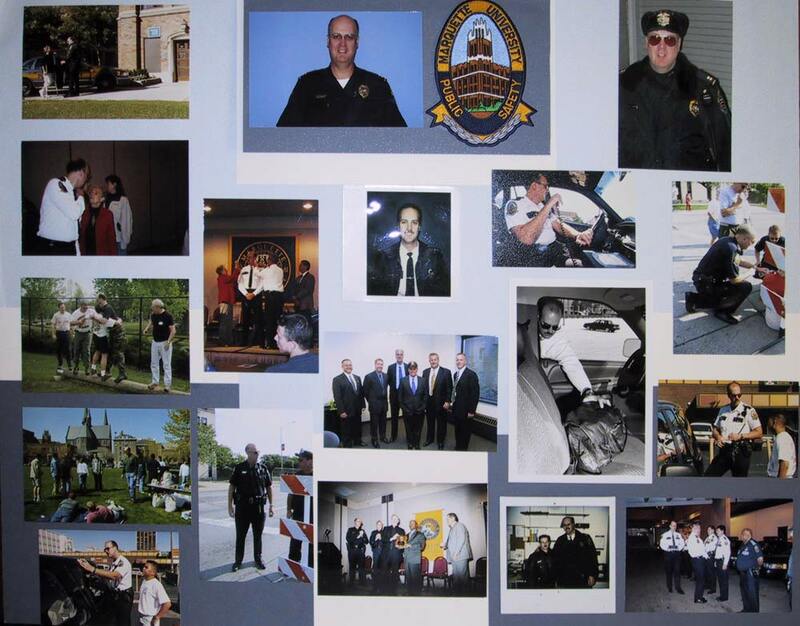 Also, if you get a chance to stop by the Public Safety Department in your travels you will see a beautifully framed portrait of Paul (done by one of his sisters [Jan]) in the main lobby area for all to see - As it should be." 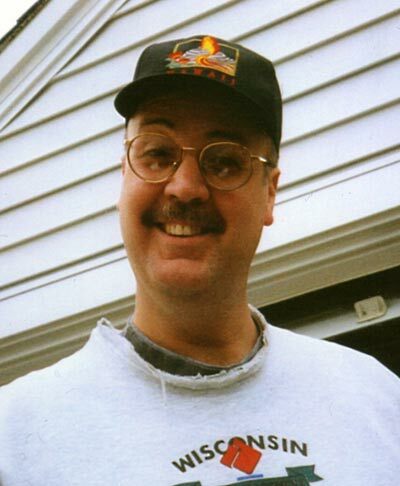 "Here's a picture of Paul with his happy face -- the expression he wore when he was goofing around. When I think of Paul, this is how he appears in my mind." "Courtesy of Chief Larry Rickard and staff, who hunted it down in their archives. 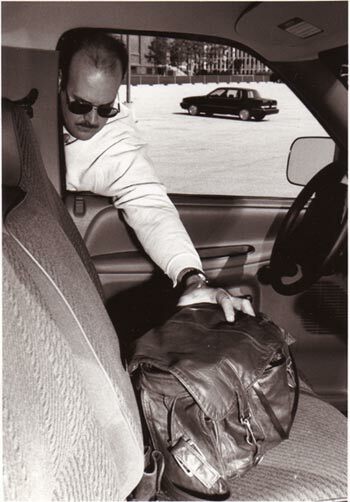 [This posed photo] was used on a pamphlet or newsletter to warn people on campus about car break-ins. Paul looks quite cold and thief-y, doesn’t he?" 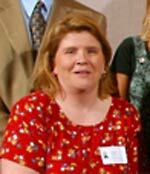 On April 17, 2007 Paul psotumously received Marquette University's Excellence in University Service Award. Mom accepted the plaque and spoke movingly. 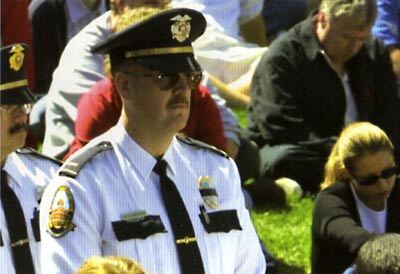 Although Jablonski passed away in Fall 2006, his legacy on campus is evident in the Student Safety Pogram, the Avenues West Police Substation , the university's Critical Incident Managment and Business Continuity Plan, Public Safety's Command Information Center and the department's relationship with the Milwaukee Police Department. "Paul was genuinely concerned about you as a person." said a nominator. 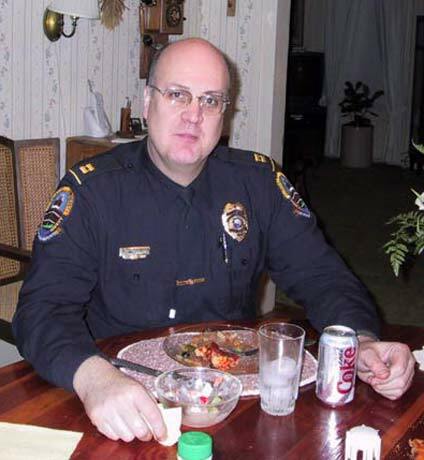 "He was very personable, approachable and resourceful. Paul loved Marquette and everything is stands for, and his love rubbed off on those who worked with him side-by-side. It would not be an overstatement to say that Paul has left an indelible mark on Marquette University." The grey squirrel flies at midnight. Translation: Cindy has Peanut M&Ms on her desk. That was the off-the-wall code I would leave for Paul. He came up with the code so he knew there would be a little something for his sweet-tooth when he stopped by the Office of Administration on business, although he said the chance to talk to Katie Shaw or me was the real draw. What a Charmer! “Tall Paul” typically greeted me with “buon giorno” when he stopped in the office. Since I didn’t know any Italian, I generally responded with “hola.” So it was always very international when he stopped by. 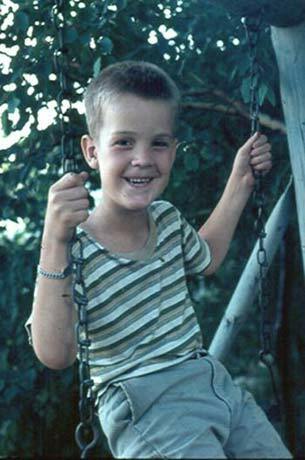 It, also, was always fun when Paul stopped by because of his never-ending supply of cute stories that he would retell. I’m going to miss Paul. 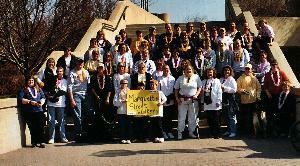 He was always the tallest member of my MS Walk team...affectionately named the Marquette Street Walkers. I would tell Paul that stiletto heels were not required for him to be a Street Walker.....he already had the height. Now I’m going to have to find another tall beacon to guide my way on the Walk. So, the grey squirrel no longer flies at midnight and the candy bowl has not contained Peanut M&Ms since Paul was last here. This tribute appreared in the MU administration newsletter, Winter 2006. View the newsletter here. Jude points out the MU newsletter that mentions Paul's Excellence in University Service Award. And the 2002 announcement of his 15 year service award is here.